You may have noticed (please, please say you've noticed!) that the posting schedule has been rather light the last two weeks. I have a valid excuse. 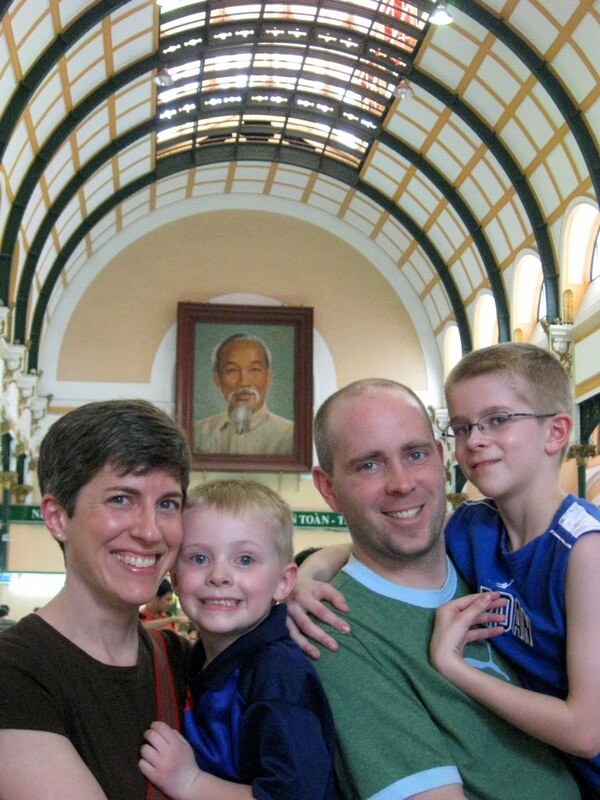 Our family traveled to Vietnam and Cambodia for two weeks to visit my sister-in-law and brother-in-law who are teaching at an international school in Saigon. 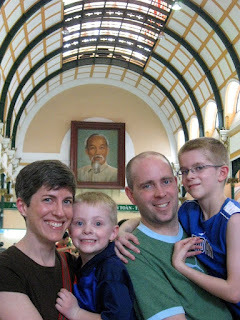 At right, you can see us visiting the portrait of Uncle Ho in Saigon's famous main post office. 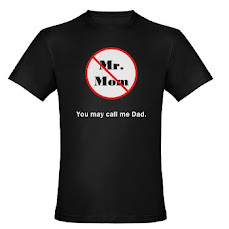 I didn't want to make a big "I'm away post" in case social-media-conscious burglars were lurking here. I'm usually not that neurotic, but I make special exceptions for two-week, 16,000 mile round trips. Anyway, I'll be back on schedule now with observations from the trip and then more regularly-scheduled competent parenting. Cool photo of you four and I can't wait for more! That picture is so cute! Kudos to the random person you got to shoot it. Lauren, you forgot "movie star handsome".